We had our office Christmas party last Friday. 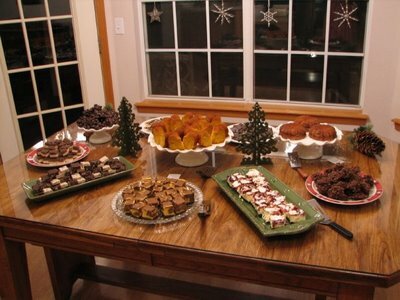 I have been posting recipes for the food I made, but I have not posted any pictures of how I set everything up for the party. I did not have a chance to take as many as I would have liked, but here are some of the food area. 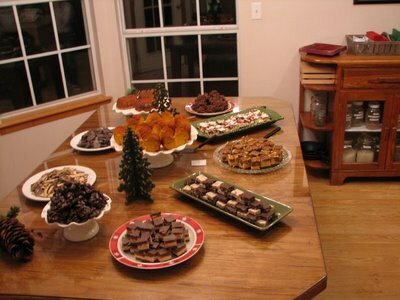 I placed desserts on the table and the appetizer foods on the bar area. I also placed the plates and silverware on my antique buffet. I filled the empty platter with different meat to go along with the crackers and cheese. I also served an artichoke dip with tortillas chips that did not make it into the pictures. After I saw the pictures I realized it looks kind of plain. I did not do much for Christmas decorations this year, in fact I usually do not do much. But now that I see pictures of it, I realize I should do more. I will try to next year. For more show and tell go to Kelli’s House. I agree, everything looks delicious! Nice layout as well. I love taking pictures of how the food looks before we eat as well. My kids sometimes think I’m a little crazy, but I enjoy it! Thanks for sharing. It all looks lovely, Lynn. What a nice spread! It looks delicious! 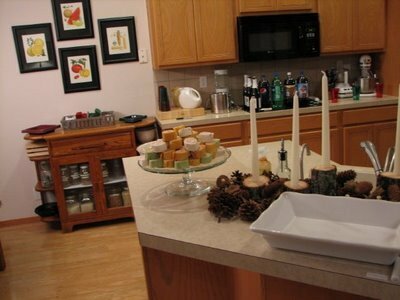 I think everything looked perfect–I love the clean and crisp look and the touches of Christmas were there–Very nice. Every thing looks so yummy. I want some of that fudge! It looks good enough to eat (pun intended.) Looks like a fun dinner party. I don’t decorate much either, and probably should. Oh well. Thanks for the post. It all looked very beautiful. If you are looking for something simple (& inexpensive), just try some fabric (tulle or lame would work well). Scrunch it around on your table before placing the platters. Instant color & texture. I personally love the clean look that you had.